I have coveted Maria McElroy, the founder of Aroma M, creations for years, and there is a reason that her handcrafted perfumes, face oils and all of her artisan creations are internationally celebrated. Each handcrafted treasure is made, by Maria herself, in small batches that she meticulously scrutinizes. As a master atelier perfumer, with the truly visionary ability to mix and create otherworldly fragrances, Maria applies this same refined sensibility and profound knowledge of her ingredients to blend among the finest face oils conceived. 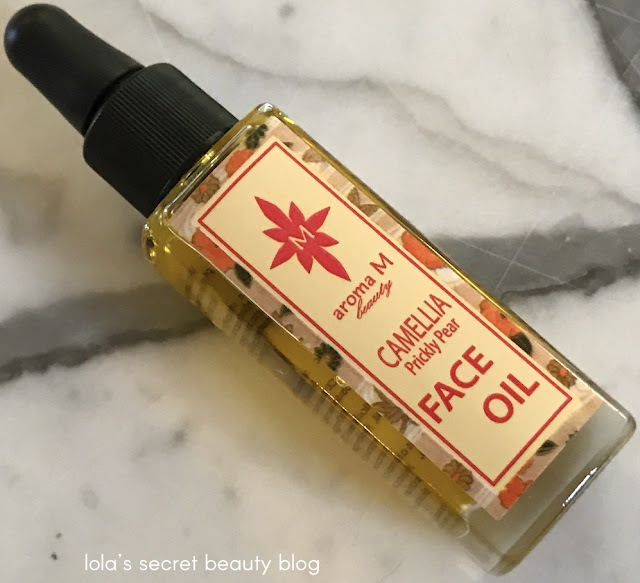 When the Makeup Wars team sought to select our favorite product that we are truly loving this winter, I knew that I needed to introduce everyone to Maria's most recent face oil, Aroma M Camellia Prickly Pear Face Oil. Aroma M Camellia Prickly Pear Face Oil is a study in refined ingredients, of the highest quality imaginable, that were selected to boast unsurpassed efficacy while maintaining an ultra-luxe feather-weight consistency that immediately melts into the skin. Aroma M Camellia Prickly Pear Face Oil is made from a fusion of Camellia Oil, Prickly Seed Oil, Golden Jojoba Oil, Apricot Kernel, Evening Primrose, Virgin Argan, and Vitamin E. Moroccan Beldi Rose Essential Oil, Egyptian Rose Essential Oil and Frankincense Essential Oil, and this ultra-luxe oil has the intoxicating aroma of the most elegant rose that lifts the spirits while each of the carefully selected ingredients work their magic on the skin. The Camellia Oil deeply nourishes and hydrates the skin. Prickly Pear Seed Oil, which is a miraculous antioxidant-rich healer, is packed Omega 6 and 9, and is rich in amino acids. Its unique properties stimulate collagen production and increase skin cell turnover, and therefore it softens the appearance of fine lines, reveals fresh and dewy skin, while the Vitamin K promotes the skin's elasticity and helps lighten the appearance of dark circles. Maria specifically selected to include Rice Bran Oil, which is rich in fatty acids and Vitamin E, because it nourishes the skin by deeply penetrating its layers, and it plumps and hydrates, aids in moisture retention, and its impressive anti-inflammatory properties soothe and calm irritated skin. Healing Golden Jojoba Oil heals damaged, irritated skin and helps retain moisture. Apricot Kernal Oil, which is rich in Vitamins A and E, deeply penetrates skin and hydrates even the driest skin. Evening Primrose Oil soothes irritated skin, calms redness, reduces inflammation, and helps to heal pimples while plumping the appearance of fine lines. Virgin Argan Oil, which is an antioxidant-rich powerhouse, is filled with fatty acids, polyphenoles and caratenoids, and together they effectively soften the appearance of fine lines and wrinkles, while healing irritation, abrasions, redness and dry flaky skin. Moroccan Beldi Rose Essential Oil, which has a rich and sweet aroma, soothes and heals skin. Eqyptian Rose Essential Oil, which is antioxidant-rich, heals breakouts, reduces inflammation, irritation and redness and hydrates the skin. Frankincense Essential Oil has anti-inflammatory and antiseptic properties that heal breakouts, balances oil production and reduces the appearance of scars and hyperpigmentation. Furthermore, it accelerates skin cell turn-over and hydrates the skin. As previously noted, this ultra-luxe feather-weight facial oil immediately melts into the skin leaving behind no oily residue. That it boasts an antioxidant-rich anti-inflammatory formula means that this potent healer soothes and calms irritated skin, and is therefore a wonderful post-peel, post-treatment beauty oil. It is also a wonderful choice for sensitive skin prone to redness and irritation, or breakouts. Furthermore, it is one of the most nourishing and deeply hydrating oils that I have tried. It leaves skin baby soft, silky smooth, supple, hydrated, lifted, more even in tone, remarkably luminous., and it also softens the appearance of fine lines. Formulated for all skin types, this delectable elixir is such a joy to use because it enraptures the senses with its luxurious texture, its otherworldly aroma and its uncompromising efficacy. These combined attributes make this a remarkable achievement for a single face oil, and it is unquestionably among the finest luxury face oils that I have ever used. preventing irritations and shaving burns. cooperative. 8 tones of cactus pears are needed to production. the skin from harmful sun damage, working as a natural sun block. sebaceous glands in the skin and is absorbs quickly to impart a velvety finish. aging. It helps rehydrate dry skin. blemishes. It helps dry skin feel more supple and smooth, and plumps up the skin. sebum and keeps it to a manageable level. properties. This heady sweet and floral fragrance is one to make you swoon. Egyptian Rose Essential Oil: Extremely rich, deep, warm, honeyed true velvety rose aroma with a hint of spice. A hydrating antioxidant that refines skin, treats acne, reduces redness and inflammation. Maximizes the benefits of all ingredients by allowing deeper penetration. fighting the signs of aging. 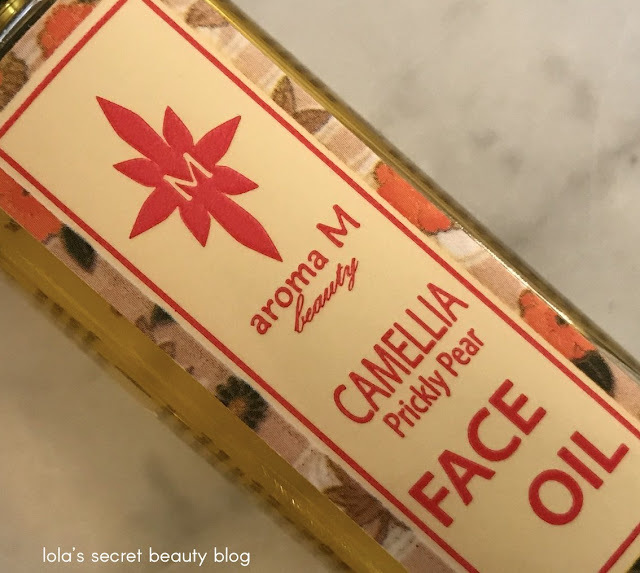 Overall Assessment: Aroma M Camellia Prickly Pear Face Oil is a truly exceptional achievement that everyone with a penchant for ultra-luxe face oils really needs to try. It is an undeniable game-changer, and it earns an unmitigated A+. Please be sure to click on the Makeup Wars! team member badges to see their must-have products! No residue or gross feeling is so important with an oil! This sounds like a great one! 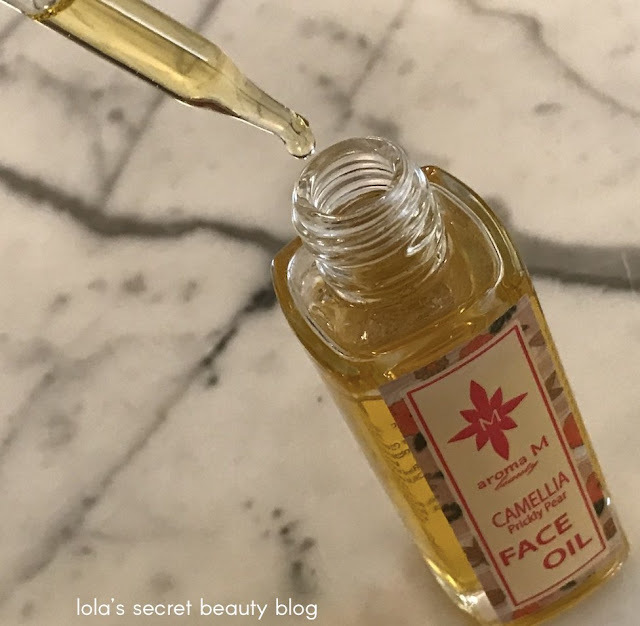 This is a SERIOUSLY special face oil! It feels divine on the skin, and leaves behind no residue whatsoever! Oh this does sound divine! Thanks for the review! It truly is divine! I think that you would love it. You are so welcome, Christine! I've been using a prickly pear oil mask for my hair, which is looking its best now. I should probably try something with the ingredient for my battered skin as well, particularly after acne scar revision. That sounds like a wonderful hair mask! Prickly Pear is quite amazing! I think that you would be incredibly impressed by this elegant, ultra-luxe face oil! Me too, and its efficacy is noteworthy! Ohmigoodness, this oil sounds divine, divine, divine! I need to try it! I am going to visit her website. I adore handcrafted perfumes and skincare! That it is divine is a true understatement, Allison! 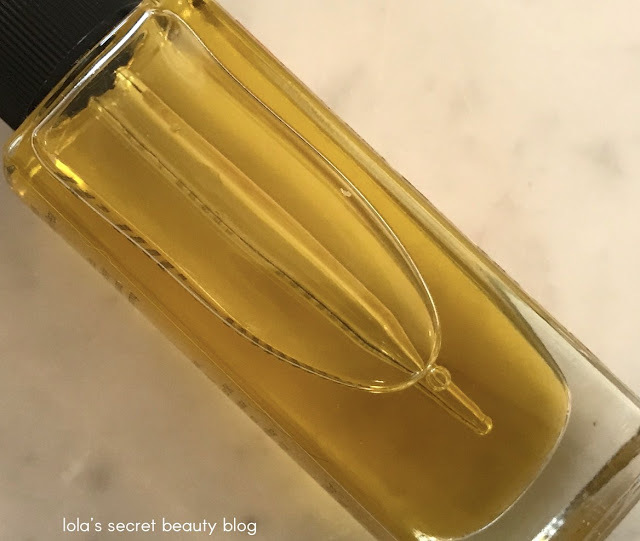 This is, indeed, a very special handcrafted face oil! I think that you would absolutely LOVE Maria's skincare and perfumes! I’ve recently been researching essential oils and have learned much about different oils good for he face - this has so many carrier and essential oils that seem like a really decadent combo for your skin. I have to check this out for myself!! It is, indeed, a very decadent combination of carrier and essential oils. Maria is a master indy perfumer, and everything that she makes is truly amazing! Everything is lovingly handcrafted! Your description is so beautiful that you make me forget that I couldn't use this fragrance. What an elegant facial oil this must be. Thank you, Marcia that is such meaningful high praise coming from you! It is a very elegant and special luxury face oil, indeed! This sounds like it would be wonderful. I've never heard of using prickly pear on the face. It really is a wonderful, and very effective, luxury face oil. Yes, Prickly Pear is quite impressive in skincare, and it works wonders on dark circles! This sounds fabulous! When I lived in AZ there were lots of pickly pear products but I've never seen it in skincare. It really is amazing, Cindy! I have seen prickly pear in skincare for a while, and it is such an effective ingredient! It really is amazing. 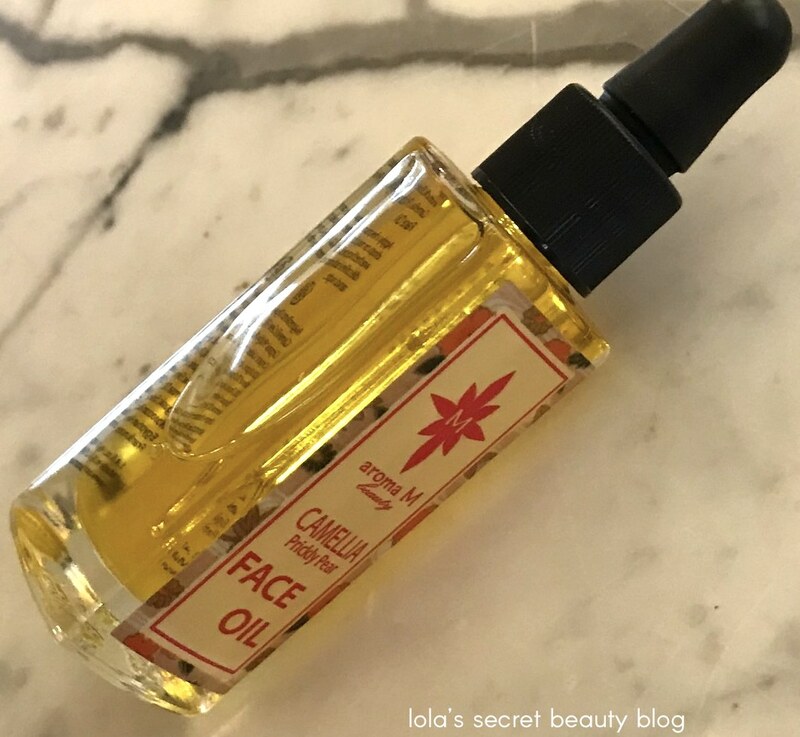 This is an incredibly effective handcrafted ultra-luxe face oil, and it is definitely worth the splurge when you finish up your current face oil. I think that you will be incredibly impressed if you try this! I have to say that I honestly didn't know what Prickly Pear even did for the skin but now I'm sold on it and this face oil! I'll have to look into this one when it comes time to replace my current face oil. 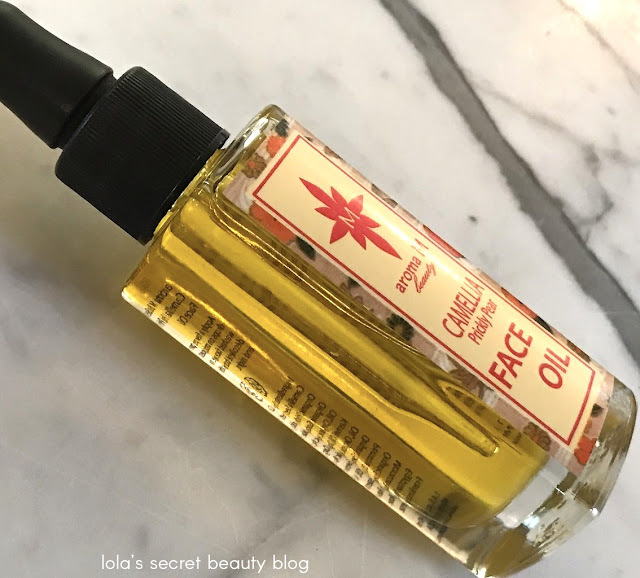 Yes, Prickly Pear is a really effective ingredient in this lovely face oil. It is definitely worth trying when you finish up your current face oil. I think that you will be very impressed by its efficacy!